Dr Kate Marvel: “We need courage, not hope, to face Climate Change“. Also the magnificent “We should never have called it Earth“, also from Dr Marvel. The question that McKibben raises is how psychologically, emotionally and politically should we as human beings respond to this fundamental change in the relationship between the human species and the world we inhabit? Notwithstanding the enormity of the climate change challenge, we know what many of the solutions are, and there are many actions that citizens can take individually and collectively to make a difference at household, local, national and global level. When people have something to do to solve a problem, they are better able to move from despair and hopelessness to a sense of empowerment. This is another nail in the coffin of the claim I heard at last year’s Lorenz-Charney Symposium at MIT that machine learning methods would not make a serious contribution to advancements in the geophysical sciences. 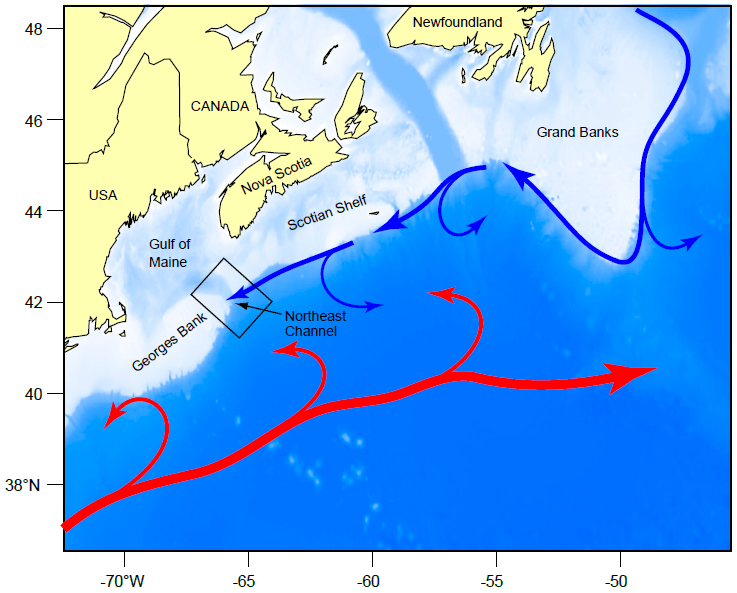 T. Bolton, L. Zanna, “Applications of Deep Learning to ocean data inference and subgrid parameterization“, Journal of Advances in Modeling Earth Systems, 2019, 11. And was it different? I mean, not based on how Curry or Tisdale feel, but by the numbers. Mother Brook in Dedham Massachusetts was the first man-made canal in the United States. Dug in 1639, it connects the Charles River at Dedham, to the Neponset River in the Hyde Park section of Boston. It was originally an important source of water for Dedham’s mills. Today it serves as an important tool for flood control on the Charles River. Like several major river features, Mother Brook is monitored by gauges of flow maintained by the U.S. Geological Survey, with careful eyes kept on their data flows by both agencies of the Commonwealth of Massachusetts, like its Division of Ecological Restoration, and by interested private organizations, like the Neponset River Watershed Association and the Charles River Watershed Association. (I am a member of the Neponset River Watershed Association.) The data from these gauges are publicly available. 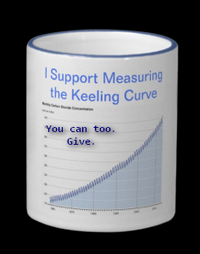 with the appropriate choice in its norder parameter, it permits the estimation of derivatives of the fitted curve as well as the curve itself. Finally, note that while residuals are not provided directly, they are easy to calculate, as will be shown here. demands the covariates each be in ascending order. Note that the lack of support by the pspline package for the multivariate case has thrown, so to speak, the gauntlet down, in order to find a replacement. Since I’m the one who, in the moment, is complaining the loudest, the responsibility falls to me. So, accordingly, I commit to devising a suitable replacement. I don’t feel constrained by the P-spline approach or package, although I think it foolish not to use it if possible. Such a facility will be the subject of a future blog post. Also, I’m a little joyful because this will permit me reacquaintance with some of the current FORTRAN language definition, using the vehicle of Simply Fortran, and its calling from R. This is sentimental, since my first programming language was FORTRAN IV on an IBM 1620. J. O. Ramsay, N. Heckman, B. W. Silverman, “Spline smoothing with model-based penalties“, Behavior Research Methods, Instruments. & Computers, 1997, 29(1).99-106. P. H. C. Eilers, B. D. Marx, M. Durbán, “Twenty years of P-splines“, SORT, July-December 2015, 39(2), 1-38. T. Krivobokova, G. Kauermann, “A note on penalized spline smoothing with correlated errors“, Journal of the American Statistical Association, 2007, 102(480), 1328-1337. T. Krivobokova, C. M Crainiceanu, G. Kauermann, “Fast adaptive penalized splines“, Journal of Computational and Graphical Statistics, 2008, 17(1), 1-20. P. Craven, G. Wahba, “Smoothing noisy data with spline functions: Estimating the correct degree of smoothing by the method of generalized cross-validation“, Numerische Mathematik, 1979, 31, 377-403. G. Wahba, Spline Models for Observational Data, Society for Industrial and Applied Mathematics, 1990, CBMS-NSF. For completeness, consider the AdaptFit package and related SemiPar package which also offer penalized spline smoothing but are limited in their support for multiple responses. M. E. Mann, “On smoothing potentially non-stationary climate time series“, Geophysical Research Letters, 2004, 31, L07214, doi:10.1029/2004GL019569. Incidentally, Professor Mann is in part responding to a paper by Soon, Legates, and Baliunas (2004) criticizing estimators of long term temperature trends. The Dr Soon of that trio is the famous one from the Heartland Institute who has been mentioned at this blog before. The code for generating these results is shown below. # Mother Brook, P-spline smoothing, with automatic parameter selection. # Jan Galkowski, bayesianlogic.1@gmail.com, 27th January 2019. # Last changed 28th January 2019. # where these are plural of there is more than one response. # the value of spar is an initial estimate. The choice of norder == 2 is arbitrary. # Force the same P-spline to use an arbitrary smoother SPAR by electing method == 1, and setting SPAR = 0.5. # Force the same P-spline to use an arbitrary smoother SPAR by electing method == 1, and setting SPAR = 0.7. The code is available online here and requires a utility from here. Having a spline model for a data actually offers a lot. First, the estimate of SEE and MAD give some idea of how accurate prediction using the model might be. With eight years of data, such models are in hand. 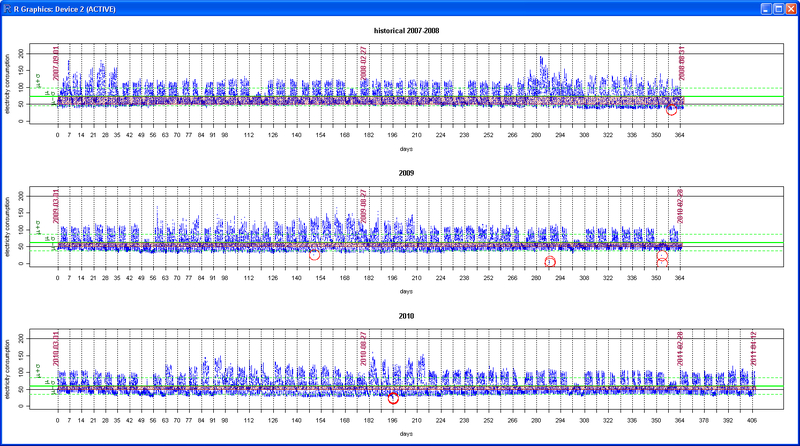 Also, having a spline model is the basis for detecting changes in stream flow rates over time. 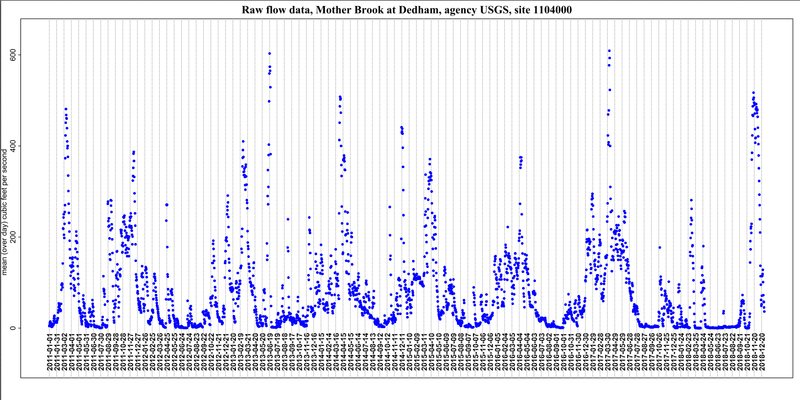 Mother Brook might not be the best example of long run stream flow rates, since the Army Corps can change their policies in how they manage it, but the same kinds of flow time series are available for many other flows in the region. To the point about changes in flow rates, having a spline model permits estimating derivatives which, in this case, are exactly these values. Moving on, once several such flows have been modeled using splines, these can serve as the basis for various kinds of regressions, whether on the response side or on the covariates side. For example, is there statistical evidence for a link between stream flows and temperature? The Clausius-Clapeyron relation suggests there should be, at least at the regional and global scale. It would be interesting to examine if it can be seen here. To me, it would be also interesting to see if some of the riverine connections in the region could be inferred from examination of flow rates alone. Downstream flows see a pulse of water from precipitation and melt, but their pulses are lagged with respect to earlier ones. Sure, one could examine such connections simply by looking at a map, or Google Earth, but there are other hydrological applications where these connections are latent. 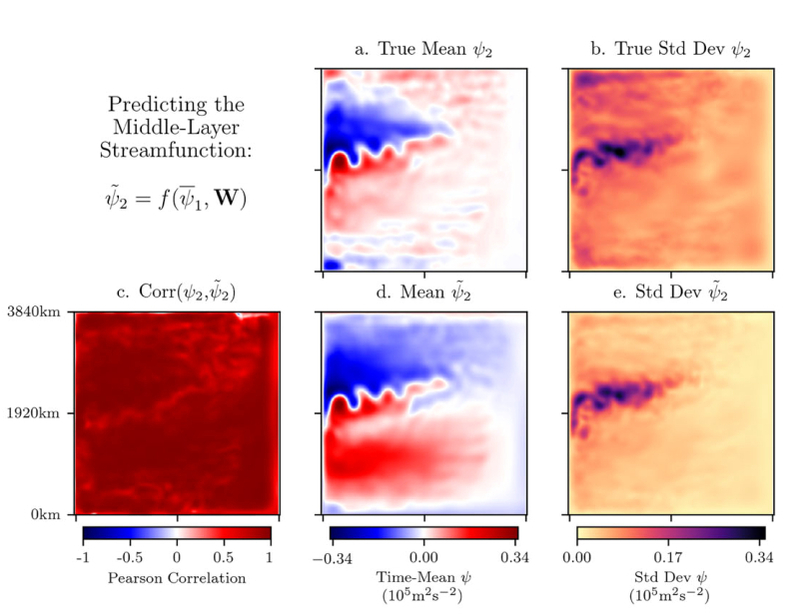 In particular, connections between subterranean water sources and surface flows might be reveals if these kinds of inferences are applied to them. The scholarly literature such as the paper by Professor Mann cited above which critiques and explains that by by Soon, Legates, and Baliunas (2004) shows careful consideration of these techniques matters. Trump has intersected with powerful women before — Hillary Clinton, most notably — and showed little hesitation to diminish and demean. But Pelosi, who once joked to me she eats nails for breakfast, is a ready warrior. She is happy to meet the demands of war, whereas Clinton was reluctant, semi-disgusted, and annoyed to be dragged to the depths that running against Trump demanded. The speaker of the House is, technically, a coastal elite from San Francisco, but she was trained in the hurly-burly of machine politics of Baltimore by her father, Mayor Thomas D’Alesandro. It is not a coincidence that Pelosi has managed, over and over, to vanquish her rivals in the challenges for Democratic leadership: she flocks to the fight, not just because she usually wins, but apparently because she likes it. Read it, particularly the quote from former Trump Organization executive Barbara Res, repeated from The New York Times. 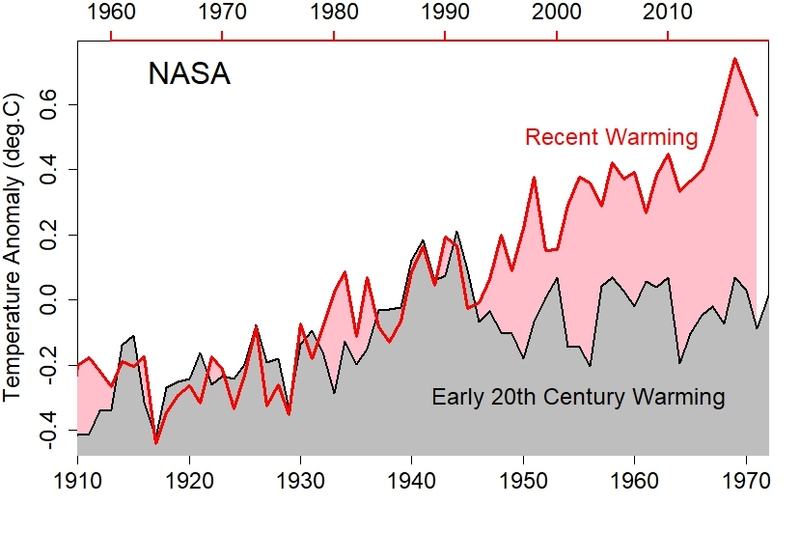 This is an excerpt from an article which appeared at RealClimate. That, in turn, is a translation of the same article which appeared in Le Monde on 11th January 2019. Recent discussions at climate-related blogs and among environmental activists make the portions of the excerpt which I have highlighted in bold especially pertinent. And, in this regard, but obviously with no support from the authors of the above piece, one of the most constructive things the climate-concerned of Massachusetts can do right now, whatever your political background and stripe, is to throw your support behind Governor Baker’s proposal to tax real estate transfers as a funding source for climate mitigation and adaptation. While The Globe quoted ELM and other environmental groups of having cautious support for the Governor’s proposal, to stand on the sidelines and fail to give him support for the proposal against the likes of the Massachusetts Association of Realtors, quoted in the article, and probably Speaker Robert DeLeo means they are more interested in their side winning than on making progress towards the common goal of mitigating climate change, adapting, and preventing. I have criticized Governor Baker, too. But this and his Executive Order 569 are really welcome, and I walk back what I said there: The Governor has either learned, or I was wrong in the first place. I’m not the only one supporting him: Foley-Hoag thinks this is a good idea, but wants the Governor to do more. The risks are here. The risks are now. There is already a 1-chance-in-100 per year of an 8 inch rain or more in 24 hours. No Massachusetts stormwater infrastructure is capable of dealing with half of that. You think that risk small? There’s an 10% chance of that happening one or more times in 10 years. There’s a 4+% chance of that happening in 5 years. The chance of a 7 inch rain or more in 24 hours is 2% each year. 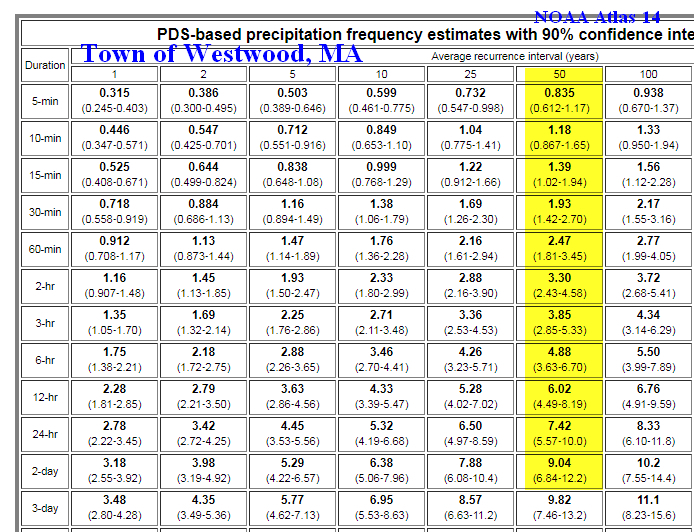 Yet Massachusetts codes allow 1960s standards for diurnal rain projections to be the standard. These are no longer the 1960s. 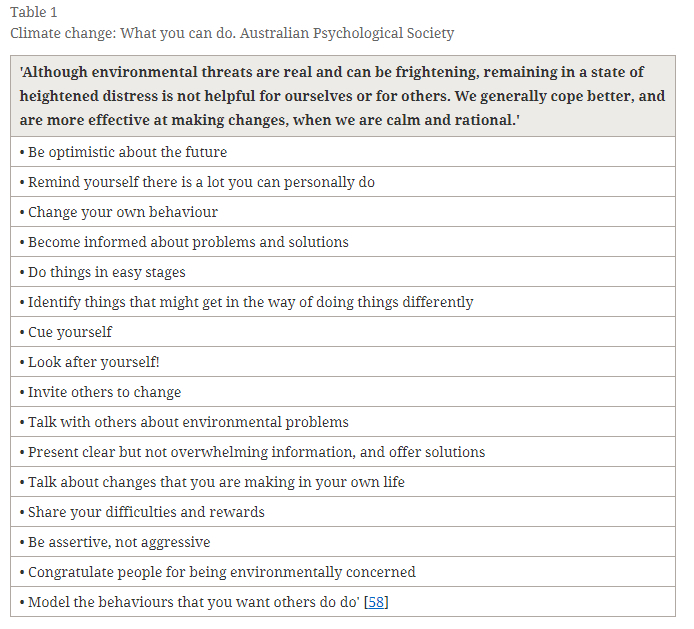 So, which is it, all the people that say they want to fix climate change? Support or not? And if you don’t support this, where is your specific counterproposal? And if you don’t have one, you don’t deserve the label “climate activist” or “environmental activist”. Just settle for politician. A measure and program I find highly constructive is the Ceres Commit to Climate program for corporations. This is a replica of a comment I made at another site. As of 23:55 EST on 21st January, it hasn’t been release from moderation. Perhaps the moderator is busy. I do not know. I am proceeding as if it will not be released, because I will be too busy during the next week or so to monitor. I am posting this as an expansion of an opinion I offered in public a few months ago, unable to include these ideas because the opinion was strongly constrained by time. The trouble, of course, is to the degree these remedies are extra-governmental and extra-Constitutional, these agents governments have little opportunity to steer these remedies. They might have steered, by participating early on, but the governments, listening to @Gingerbaker’s “Us” chose to pursue the comfortable, uncontroversial paths. To the extent governments cannot fix the problem without the consortium of collective buyers, they’re stuck. This is unfortunate. But this is what happens when fundamental responsibilities are repudiated. 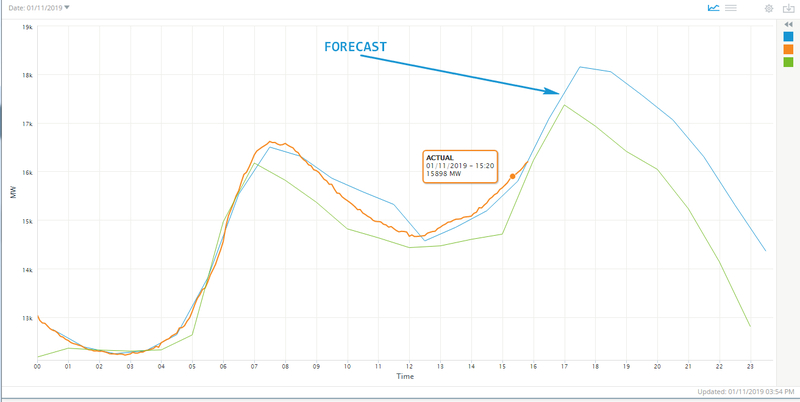 Prediction of electrical load demand or, in other words, electrical energy consumption is important for the proper operation of electrical grids, at all scales. RTOs and ISOs forecast demand based upon historical trends and facts, and use these to assure adequate supply is available. 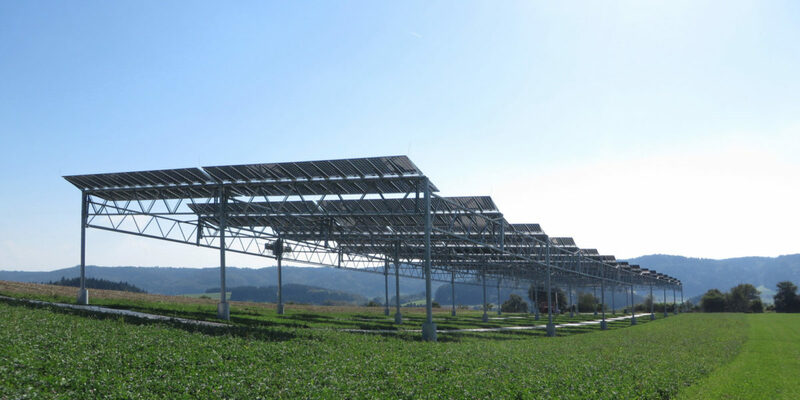 This is particularly important when supply is intermittent, such as solar PV generation or wind generation, but, to some degree, all generation is intermittent and can be unreliable. Such prediction is particularly difficult at the small and medium scale. At large scale, relative errors are easier to control, and there are a large number of units drawing upon or producing electrical energy which are amassed. At the very smallest of scales, it may be possible to anticipate usage of single institutions or households based upon historical trends and living patterns. This has only partly been achieved in devices like the Sense monitor, and prediction is still far away. Presumably, techniques which apply to the very small could be scaled to deal with small and moderate size subgrids, although the moderate sized subgrids will probably be adaptations of the techniques used at large scale. There is some evidence that patterns of electrical consumption directly follow the behavior of the building’s or home’s occupants that day, modulated by outside temperatures and occurrence of notable or special events. Accordingly, being able to identify the pattern of behavior early in a day can offer power prior information for the consumption pattern that will hold later in the day. There is independent evidence occupant do, in a sense, select their days from a palette of available behaviors. This has been observed in Internet Web traffic, as well as secondary signals in emissions from transportation centers. Discovering that palette of behaviors is a challenge. 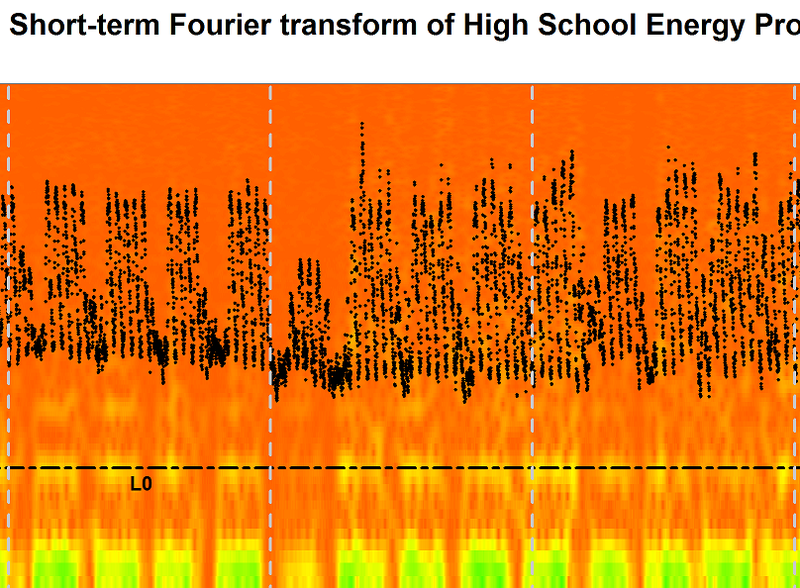 This post reports on an effort do such discovery using time series of electricity consumption for 366 days from a local high school. Consumption is sampled every 15 minutes. The point of this exercise is to cluster days together in a principled day, so to attempt to derive a kind of palette. One “color” of such a palette would be a cluster. Accordingly, if a day is identified, from the preliminary trace of its electricity consumption as being a member of a cluster, the bet is that the remainder of the day’s consumption will follow the patterns of other series seen in the cluster. If more than one cluster fits, then some kind of model average across clusters can be taken as predictive, obviously with greater uncertainty. 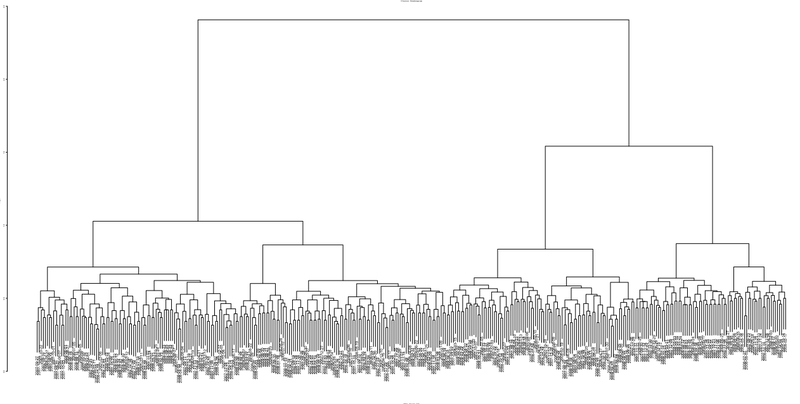 The facilities of the dynamicTreeCut package of R were used to find a place to cut the dendrogram and thus identify clusters. The cutreeDynamic function was called on the result of hierarchical clustering, using the hybrid method, and a minimum cluster size setting of one, to give the cluster chooser free range. There were 5 clusters found. Here they are in various ways. "Thursday"    "Friday"    "Monday"    "Friday"    "Monday"   "Tuesday"    "Friday"   "Tuesday"  "Thursday"    "Monday"   "Tuesday" "Wednesday"  "Thursday"   "Tuesday"
"Wednesday"    "Monday"   "Tuesday"    "Monday" "Wednesday"    "Friday"    "Monday"   "Tuesday"   "Tuesday" "Wednesday" "Wednesday"    "Monday"   "Tuesday" "Wednesday"
"Thursday"   "Tuesday" "Wednesday"    "Friday"    "Monday"   "Tuesday" "Wednesday"  "Thursday"    "Friday"    "Friday"   "Tuesday" "Wednesday"  "Thursday"    "Friday"
"Tuesday" "Wednesday"  "Thursday"   "Tuesday" "Wednesday"  "Thursday"   "Tuesday" "Wednesday"  "Thursday"    "Monday"   "Tuesday" "Wednesday"    "Monday" "Wednesday"
"Thursday"    "Monday" "Wednesday"  "Thursday"    "Friday" "Wednesday"    "Monday"   "Tuesday"   "Tuesday" "Wednesday"  "Thursday"    "Friday"    "Friday" "Wednesday"
"Monday" "Wednesday"    "Monday" "Wednesday"    "Friday"    "Monday"    "Monday"  "Thursday"   "Tuesday" "Wednesday"    "Sunday"    "Monday" "Wednesday"  "Thursday"
"Saturday"   "Tuesday"    "Friday"   "Tuesday" "Wednesday"  "Thursday"    "Monday"   "Tuesday"    "Friday"   "Tuesday" "Wednesday"  "Saturday"    "Monday"    "Monday"
"Monday"   "Tuesday"  "Saturday" "Wednesday"  "Thursday"  "Saturday"  "Thursday"    "Monday"  "Saturday"  "Saturday"    "Sunday"    "Monday"    "Friday"    "Monday"
"Saturday"  "Saturday"    "Sunday"   "Tuesday"  "Saturday"  "Thursday"    "Friday"    "Monday"  "Saturday"  "Thursday"    "Monday" "Wednesday"    "Friday"    "Monday"
"Saturday"    "Monday"    "Monday"    "Friday"  "Saturday"    "Monday"  "Saturday"    "Sunday"    "Friday"    "Monday"   "Tuesday" "Wednesday"  "Thursday"    "Friday"
"Tuesday"  "Thursday"  "Saturday"   "Tuesday"    "Sunday"    "Friday"  "Saturday"  "Saturday"  "Thursday" "Wednesday"  "Thursday"    "Friday"    "Monday"   "Tuesday"
"Friday"  "Thursday"    "Friday"  "Thursday" "Wednesday"  "Saturday"  "Thursday"    "Sunday"  "Thursday"  "Saturday" "Wednesday"  "Thursday"    "Friday"    "Sunday"
"Monday"    "Sunday"    "Friday"    "Monday"   "Tuesday" "Wednesday"  "Thursday"   "Tuesday" "Wednesday"    "Friday"  "Saturday"   "Tuesday" "Wednesday"    "Friday"
"Saturday"    "Sunday"   "Tuesday" "Wednesday"    "Friday"  "Saturday" "Wednesday"  "Thursday"
"Wednesday"   "Tuesday" "Wednesday" "Wednesday"    "Friday"    "Friday"  "Thursday"   "Tuesday" "Wednesday"  "Thursday"    "Friday" "Wednesday"  "Thursday"    "Friday"
"Thursday" "Wednesday"  "Thursday"    "Friday" "Wednesday"  "Thursday"    "Friday"    "Monday"   "Tuesday"   "Tuesday"  "Thursday"    "Friday"    "Friday"    "Monday"
"Thursday"    "Friday"  "Thursday" "Wednesday"    "Monday"   "Tuesday" "Wednesday"  "Thursday"    "Monday"    "Friday"    "Friday"  "Thursday"   "Tuesday"    "Friday"
"Monday" "Wednesday"    "Friday"  "Saturday"   "Tuesday"    "Monday" "Wednesday"  "Thursday"    "Monday"    "Monday"   "Tuesday" "Wednesday"    "Monday"   "Tuesday"
"Thursday"   "Tuesday"   "Tuesday"   "Tuesday" "Wednesday"  "Thursday"    "Friday"   "Tuesday"    "Friday"    "Friday"   "Tuesday"    "Friday"    "Monday" "Wednesday"
"Saturday"    "Monday"    "Sunday"    "Monday"    "Friday"   "Tuesday"   "Tuesday"
"Saturday"   "Sunday"   "Sunday"   "Sunday" "Saturday"   "Sunday"   "Sunday" "Saturday"   "Sunday"   "Sunday"   "Sunday" "Saturday"   "Sunday"   "Monday" "Saturday"   "Sunday"
"Saturday"   "Sunday"   "Sunday" "Saturday"   "Sunday" "Saturday"   "Sunday" "Saturday"   "Sunday"  "Tuesday" "Saturday"   "Sunday"  "Tuesday"   "Sunday" "Saturday"   "Sunday"
"Saturday"   "Sunday" "Saturday"   "Sunday"   "Sunday" "Saturday"   "Sunday" "Saturday"   "Sunday" "Saturday"   "Sunday"   "Sunday"   "Sunday"   "Friday" "Saturday"   "Sunday"
"Sunday" "Saturday"   "Sunday" "Saturday"   "Sunday" "Saturday"   "Sunday" "Saturday"   "Sunday" "Saturday"   "Sunday" "Saturday"   "Sunday"   "Sunday" "Saturday"   "Sunday"
"Sunday" "Saturday" "Saturday"   "Sunday" "Saturday"   "Sunday"   "Sunday"   "Sunday"   "Sunday"   "Sunday"
"Thursday"    "Monday"    "Friday"  "Saturday"    "Monday"  "Thursday"   "Tuesday" "Wednesday"  "Thursday"    "Friday"   "Tuesday" "Wednesday"  "Thursday"    "Monday"
"Thursday"    "Monday"  "Thursday"  "Thursday"  "Thursday"    "Friday"  "Saturday"    "Monday"    "Friday"  "Saturday"
Note that most of the weekend days are in cluster 4 along with a Christmas Tuesday (25 December 2007) and Veterans Day (observed) on a Monday, 12 November 2007, and a Good Friday, 21 March 2008. Assigning meanings to the other clusters depends upon having events to mark them with. It’s known, for example, that the last day of school in 2008 was 20th June 2008. Unfortunately, the academic calendars for 2007-2008 have apparently been discarded. (I was able to find a copy of the 2008 Westwood High School yearbook, but it is not informative about dates, consisting primarily of photographs.) Accordingly, it’s necessary to look for internal consistency. There is a visual way of representing these findings. 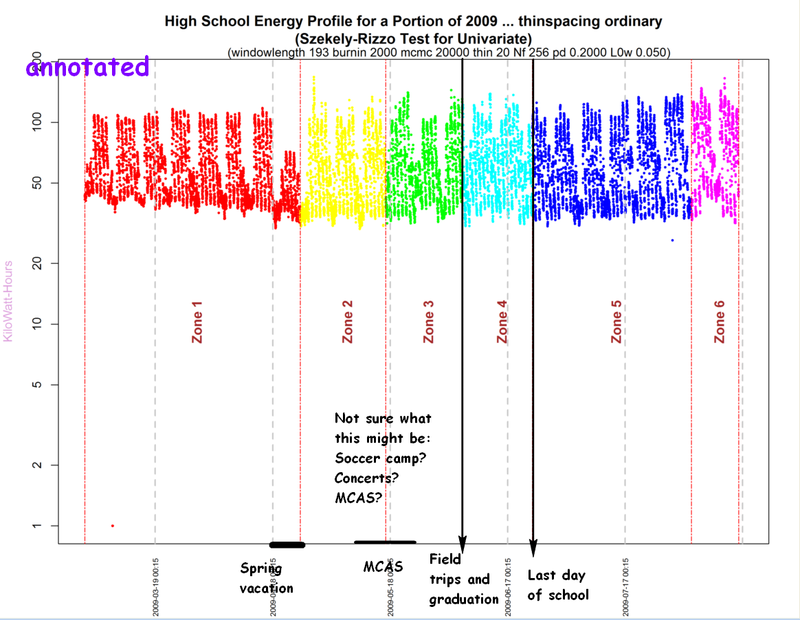 The figure below, a reproduction of the one at the head of the blog post, traces energy consumption for the high school during each day. The abscissa shows hours of the day, broken up into 96 15-minute intervals. For each of 366 days, the energy consumption recorded is plotted, and the lines connected. Each line is plotted in a different color depending upon the day of the week. The colors are faded by adjusting their alpha value so they can be seen through. Note how days with flat energy consumption tend to be in a single color. These are apparently weekend days. Atop of each of the lines describing energy consumption, a black numeral has been printed which gives the cluster number to which the day was assigned. These are printed at the highest point of their associated curves, but these are jittered so they don’t stack atop one another and make them hard to distinguish. The clusters go along with consumption characters. A proactive energy management approach would entail examining the activities done on the days in each of the clusters. Of special interest would be clusters, such as clusters 1 and 3 which have very high energy usage. The code and data reviewed here are available in my Google replacement for a Git repository. I am next planning to apply this clustering technique to long neglected time series of streamflow in Sharon, MA and on the South Shore. Despite the surge of interest in plastic bag bans, the environmental sustainability numbers haven’t been run. For example, it makes no sense to trade using paper bags instead of plastic ones, even if the paper is recycled, because paper is a nasty product to make, and more emissions are involved shipping paper bags than plastic ones. Paper bags are heavier, get wet, and cost towns and residents to recycle or dispose. The City of Cambridge, Massachusetts, put fees on all retail bags, but did that after studying the matter for seven years. Reports on their study are available at the City of Cambridge Web site. Even reusable bags have an impact to be made, and, if used, must be reused one or two hundred times to offset their own upstream environmental impacts in comparison with plastic bags, downstream impacts and all. The biggest problem people have with reusable bags is remembering to bring them along. We don’t really know what happens to plastic bags in oceans, apart from anecdotal evidence of harm to macroscale creatures. Cigarette filters and microplastics seem to persist. for some of the complexities. Wishful environmentalism can be damaging: It consumes policy good will, energy on the part of activists, and misses addressing substantial problems, like expansive development, which cause far greater harm to the natural world. And, worse, the “feel good” of not using plastic bags, or helping to ban them tends to justify personal behaviors which are more damaging, such as taking another aircraft flight for fun that hasn’t been properly offset in its emissions (*). Air travel is a huge contributor, and has, thus far, never been successfully penalized for its contributions to human emissions. The last round on that was fought during the Obama administration which fiercely negotiated with Europe not to have to pay extra fees for landing in EU airports. This sounds discouraging, but I am not discouraged. The natural world has repeatedly dealt with species which were resource hogs. That it ends poorly for the species who do is a salutary lesson for those which can observe it, assuming they learn. Claire bought me a wonderful book for the holidays. It’s Theory-based Ecology by Pásztor, Botta-Dukát, Magyar, Czárán, and Meszéna, and I got it for my Kindle Oasis. It has a number of themes but two major ones are (1) exponential growth of unstructured populations, and (2) the inevitability of population regulation. By the latter they mean organism deaths due to insufficient resources, or, in other words, growth beyond the carrying capacity. In our case, that kind of collapse or growth is mediated by an economic system, one which suffers its own periodic collapses. Accordingly, the choice is whether to keep hands off and allow such a collapse via a Minsky moment occur on its own, or, instead, intervene and have a controlled descent. We are not as self-sustaining as we collectively think, and developed countries, although wealthier and replete with resources, also have a greater cross section for impact and harm. So, what’s the good news? The end of denial by financial markets and government leaders is nearly at hand. For most investors, the risks of climate change loom beyond their investment horizon. It’s been easy for investors to operate in a speculative carbon bubble, acting as though there are no impending costs to earnings-per-share or to liabilities in their portfolios from the buildup of carbon in the atmosphere. But these costs may increasingly look real, and when investors start taking these costs into account, markets will revalue: not just oil and gas stock, but all stocks. Companies have facilities that will be flooded or be without needed water for production; supply chains will need to be rebuilt; costs of transportation will increase. What about the costs to financial institutions as communities need to be abandoned because of flood or drought? What are the fiscal consequences to governments of rebuilding airports, roads and other critical infrastructure? What will happen to consumer spending? There will be winners and losers in this revaluation, but as past speculative bubbles have shown us, when they burst, markets move very quickly. Government leaders have likewise largely operated in a bubble. It is the rare leader who can spend political (or taxpayer) capital on addressing an over-the-horizon problem. When the bubble bursts, government leaders will need to address the real concerns of rebuilding infrastructure, food and water security, and public health threats that will be seen by voters as imminent. (*) This is actually pretty straightforward to do. Here’s our formula. There is something called the New England Wind Fund. Essentially, contributions are used to buy WRECs, and one WREC prevents 842 pounds of CO2 emissions on the electric grid. Thecarbonfootprint.com offers a CO2 travel calculator. It tells how much CO2-equivalents are produced from a flight. (They offer calculators for other modes of travel, too.) They also offer you a vehicle for offsetting right on the spot, but I do not recommend using it. They do also make available a check box for additional forcing effects, which I always check. This is because emissions at typical aircraft altitudes are worse than at sea level or on the ground. The result is in metric tonnes, where 1 metric ton is 1000 kilograms. There are 2.2 lbs per kilogram. So 1 WREC prevents 383 metric tonnes of CO2 emissions. For a trip, calculate how much emissions you will make in units of WRECs, and then go to the New England Wind Fund site and contribute US$40 for each WREC. I don’t recommend using the carbonfootprint.com offset because, while they could be fine, Carbon offsetting programs need constant auditing and checking, and there are some unscrupulous operators out there who use these for greenwashing purposes only. I know New England Wind, though, and these really do get converted into WRECs. My most political post yet … yeah, but it’s me, and Bill Maher is, most of the time, what I’m down with. Sorry, but there are distinctions to be made. The idea of a calculating a distance between series for various purposes has received scholarly attention for quite some time. The most common application is for time series, but particularly with advent of means to rapidly ascertain nucleotide and ligand series, distances between these are increasingly of inferential interest. Pairwise normalized compression distance (NCD) is a parameter-free, feature-free, alignment-free, similarity metric based on compression … The way in which objects are alike is commonly called similarity. This similarity is expressed on a scale of 0 to 1 where 0 means identical and 1 means completely different … To define the information in a single finite object one uses the Kolmogorov complexity  of that object (finiteness is taken as understood in the sequel). Information distance  is the information required to transform one in the other, or vice versa, among a pair of objects … Here we are more concerned with normalizing it to obtain the so-called similarity metric and subsequently approximating the Kolmogorov complexity through real-world compressors . This leads to the normalized compression distance (NCD) which is theoretically analyzed and applied to general hierarchical clustering in . The NCD is parameter-free, feature-free, and alignment-free, and has found many applications in pattern recognition, phylogeny, clustering, and classification …. This is exciting because it offers a way of, if you will, doing really non-parametric statistics: Not only don’t inferential procedures based upon these not care about statistical distributions which the units of study exhibit, they are opaque to many features which might sidetrack inference with outlying characteristics. These sometimes arise from simple mistakes in measurement or record. It’s to be expected, I think, that use of such techniques will result in loss of statistical power in comparison to inferences based upon good parametric models for a given dataset. On the other hand, it’s almost impossible to make specification errors, or form Likelihood functions improperly. Aspects of models which cause these just are not seen. In other words, is not a metric distance. is not one either, but it is symmetric. This why, in the title I refer to it as a symmetrized divergence and to differentiate from the standard Cilibrasi and Vitányi I call it SNCD and I refer to it as a divergence(*). gets to an index which does extend across the Reals and can be readily used for statistical inference. The logit is a well-known transform for mapping probabilities onto the Real line. However, the Triangle Inequality is not respected, so the geometry is non-Euclidean. In addition to introducing Normalized Compressed Divergence to the readership, something which I’ll be using in future posts, I constructed several series which show similarities to one another. The pseudo-distances between related pairs of these were calculated, as were their logits. Below I show the series, and then I present a table showing the results. Hopefully, this gives some idea of what series are considered familiar or not. These are two similar instances of a curve and dataset taken from Sivia and Skilling. Both divergences between these curves and intermediate ones are calculated in the results below. These are instances of a basic sine series and three modulations of it. y.trig0 shows 4 waves from a sine function with frequency one. 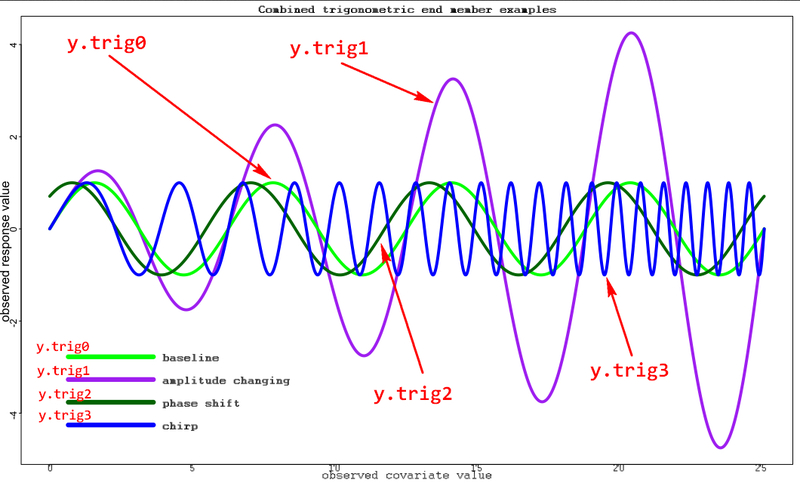 y.trig1 shows 4 waves from a related function, one with an amplitude modulation of . y.trig2 shows 4 waves from a related function, one shifted in phase by an eighth of a wavelength, that is . y.trig3 shows 4 waves from a related function, one chirped in frequency, as , where steps in in thousandths. When calculating a compressed version of a signal, generally speaking, practical compressors demand a string version of the signal. I have chosen to use the xzip compressor with the “-9e” header option, as specified in the R internal memCompress function. This means a length divergences cannot be zero, but, nevertheless, the divergence could be. Also, numeric signals need to be converted to characters. There are many ways that could be done. I originally used the technique in the TSclust package of R, since that was the only package which overtly claimed to offer an NCD dissimilarity measure. But it turns out that has problems, at least for numerical series. The is also a TSdist package which simply imports the corresponding dissimilarity measures from TSclust. Apart from the fact that .ts.sanity.check doesn’t work, not that the numeric series are simply converted to character strings in .compression.lengths before being subjected to compression and, subsequently, calculation of the NCD. This cannot be correct. Consider what would happen if there were two time series, and , each of length 100. Suppose consists of a sequence of 50 copies of the string “3.1” followed by a sequence of 50 copies of the string “3.2”. Suppose consists of a sequence of 50 copies of the string “3.2” followed by a sequence of 50 copies of the string “3.1”. Using the dissVSTR function from below, which operates purely on strings, not on statistical series, the SNCD is 0.7. Now consider two other series, like these but slightly modified, and , also each of length 100. But instead, suppose consists of a sequence of 50 copies of the string “3.01” followed by a sequence of 50 copies of the string “3.02” and consists of a sequence of 50 copies of the string “3.02” followed by a sequence of 50 copies of the string “3.01”. If these were statistical series, the values are close to one another than they were. But since they are strings, and have an additional numeral zero, dissVSTR actually shows their SNCD is larger, about 0.73, implying they are father apart. I first tried to fix this in an earlier version of this post by precalculating a combined set of bins for the pooled values in both series based upon standard binning logic in the sm package and then quantiles using the hdquantile function of the Hmisc package. I then assigned a character to each of the resulting bins and used the R cut function to determine to which bin each of the individual series belonged and coded that. This was a bit better, but I still think it was wrong: Bins corresponding to bigger values hadn’t any more mass than smaller bins and, so, a distance apart at a larger bin was ranked in information distance exactly the same way as a bin apart at the low end. Next, assign a unique string character to each of the resulting bins. But instead of just using that character by itself, replicate it into a string with the same number of repetitions as the bin number. Thus, if there are bins, the bin containing the smallest values has its character just of length unity, but the last bin, bin , has its corresponding character replicated times. Finally run over the two series, and code them by emitting the repeated bin labels corresponding to the bin in which they fall. This is the result submitted for compression comparison. There is an additional thing done to accommodate NA values in the series, but the reader can check the code below for that. There are 6 cases which serve as end members in various capacities, as shown above. 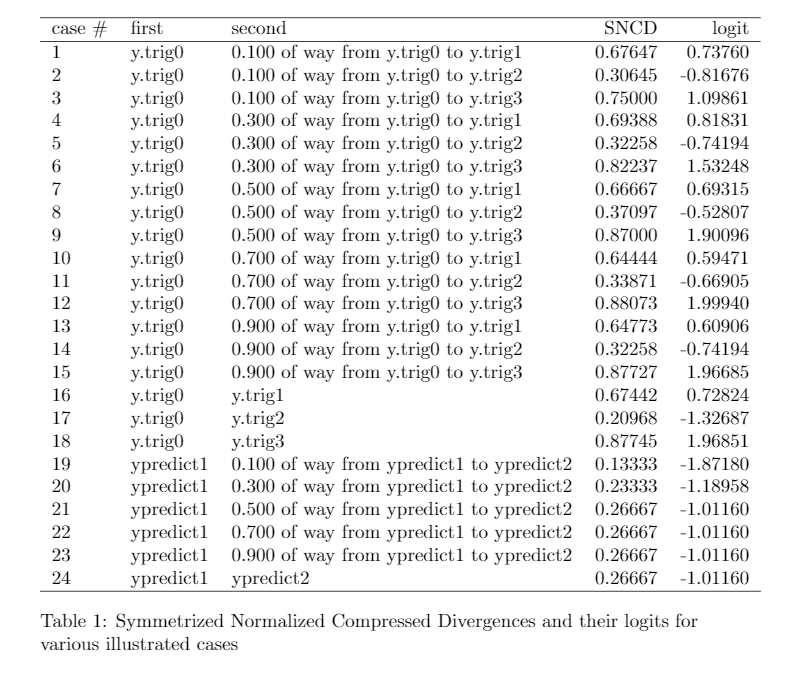 The divergences between ypredict1 and ypredict2 are shown, as are divergences between y.trig0 and y.trig1, y.trig0 and y.trig2, y.trig0 and y.trig3, y.trig1 and y.trig2, y.trig1 and y.trig3, and finally y.trig2 and y.trig3. is the intermediate morphing between the two. 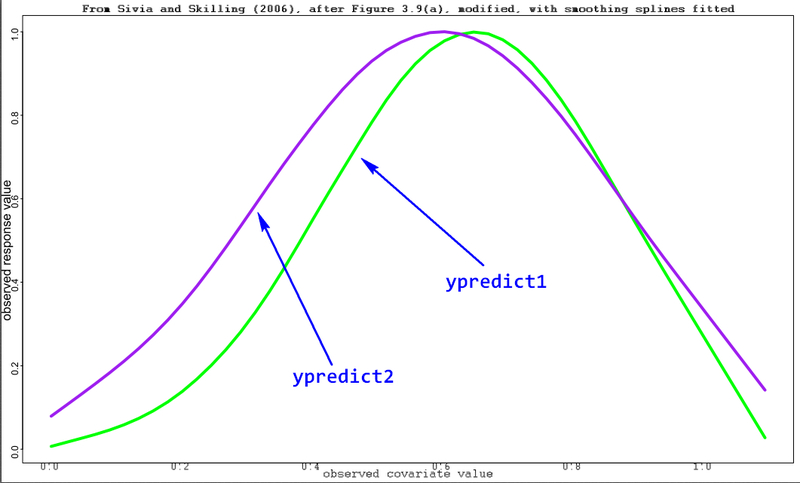 Using the divergence between ypredict1 and ypredict2 as a baseline, the modulation of the sine case, y.trig0, into its phase shifted counterpart, or y.trig2, is see as the least change. The amplitude modulated version of y.trig0 called y.trig1 has a substantial divergence, but not as much as the chirped version called y.trig3. The intermediate versions of these behavior predictably. It is a little surprising that once ypredict1 is transformed 0.7 of the way to ypredict2, the divergence doesn’t worsen. Also, in the case of the sinusoids, divergences as the curves approach the other end point do not change monotonically. That isn’t surprising, really, because there’s a lot going on with those sinusoids. Intermediate datasets, R code for the above results is available from a directory in my Google drive replacement for Git. New versions of the codes have been uploaded to the Google drive. The old versions are still there. # Symmetrized NCD of the above. # Since logits are so common in inference, calculate those, too. # from to the consumer of the output. Can't anticipate that here. (*) L. Pardo, Statistical Inference Based on Divergence Measures, Chapman & Hall/CRC, 2006. (**) Others have done important work in this area, including I. J. Taneja (2013) in “Generalized symmetric divergence measures and the probability of error“, Communications in Statistics – Theory and Methods, 42(9), 1654-1672, and J.-F. Coeurjolly, R. Drouilhet, and J.-F. Robineau (2007) in “Normalized information-based divergences“, Problems of Information Transmission, 43(3), 167-189. 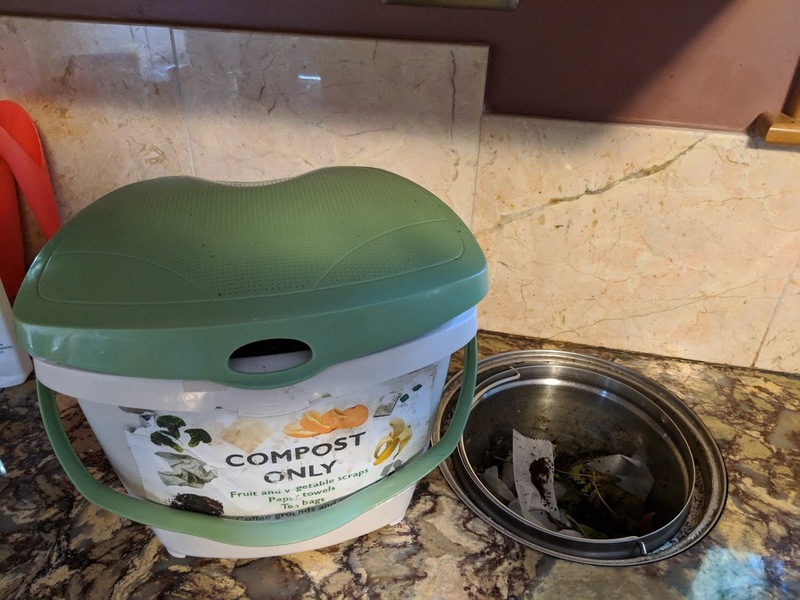 Many people compost. It can be easy or hard, depending upon your tolerance for turning and work, and of the Wild Thing who wants a free meal. I can imagine and have known dogs to get into bins, and racoons supposedly get into them. 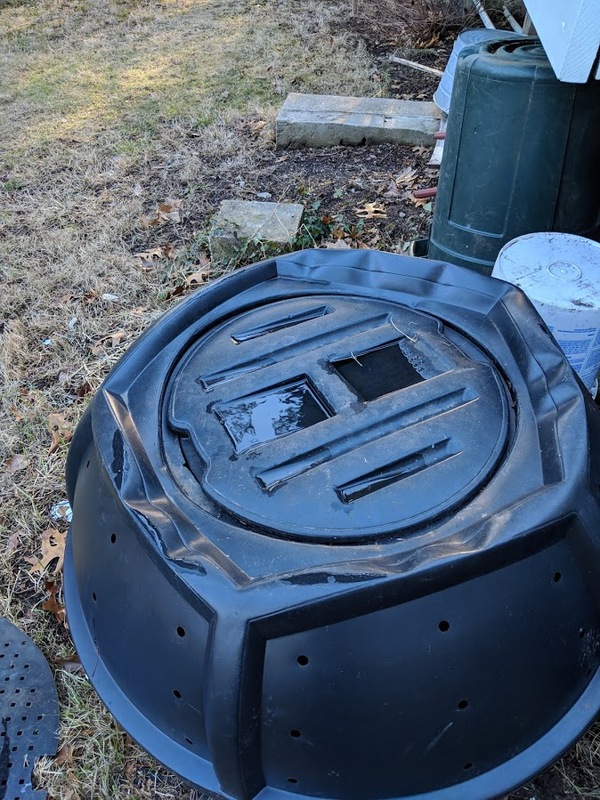 There’s plenty of photo evidence online of racoon footprints near compost piles and bins, and I have seen muddy footprints of racoons on the outside of ours, but I haven’t found a single online photo of a racoon in a compost bin. Racoons might be hardy, but my wife, Claire, once had a granddog that got into some partly cooked compost and soon developed seizures because the partly digested compost had neurotoxins from microbial activity. This did require expensive hospitalization. So it’s a good idea to keep your compost bins protected from the stray mammal. That’s a shot of our twin compost bins. The active one is above. The other is “cooking down” over the winter, and should be ready for garden and yard use by late Spring. We have a New England-style Blue Bin which collects rainwater from our roof and gutter system. We use this almost exclusively to add water to the compost in late Spring, Summer, and Autumn, and wash out pails and implements. It is 1st January, after all, in greater Boston, Massachusetts. 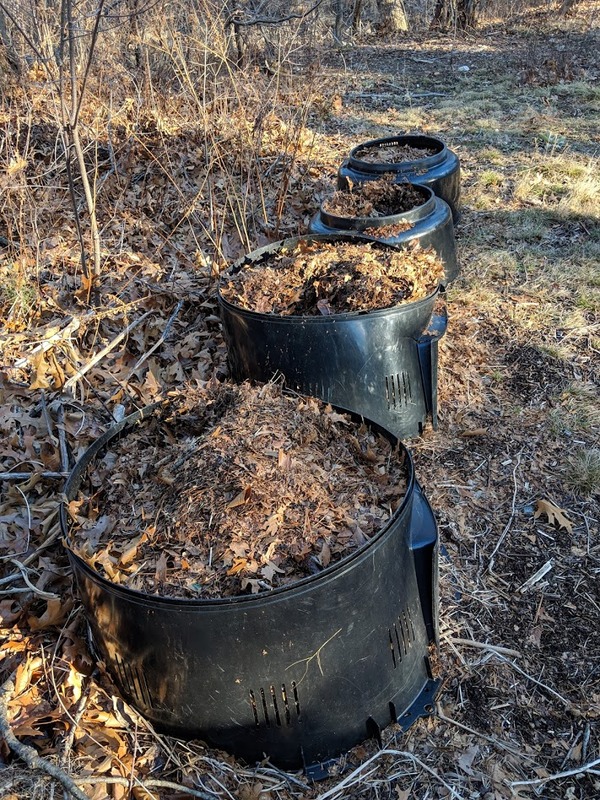 This brings me to what I want to primarily write and talk about: How to do winter composting. Happy to share. 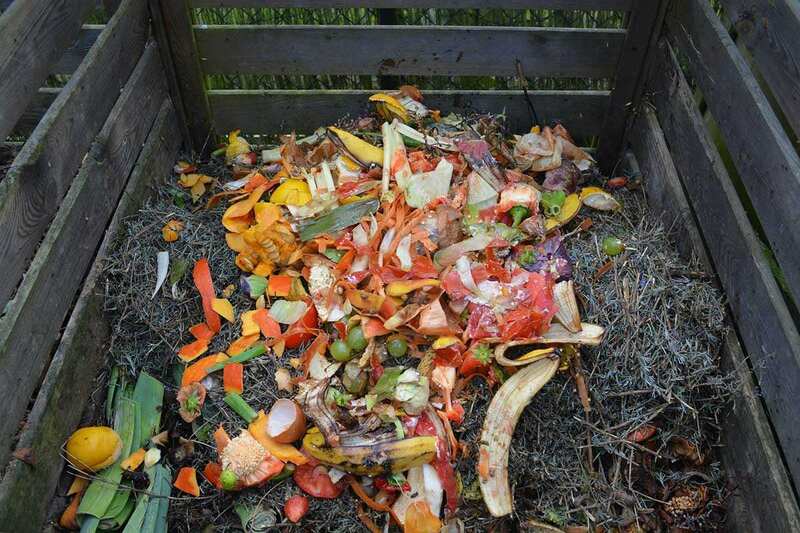 Now, there are several sources for composting which claim meats and cheese are unsuitable. I can imagine that, in the case of open compost piles, or extreme quantities, it might be a good idea to keep these out of your compost. But Claire and I are vegetarians, for the most part, we like our cheese, and we have three cats. That means we have scrapes from cat food. That’s Darla, by the way. For the most part, we We never trash our bio-organic waste. The exception is the litter from the cat litter boxes. 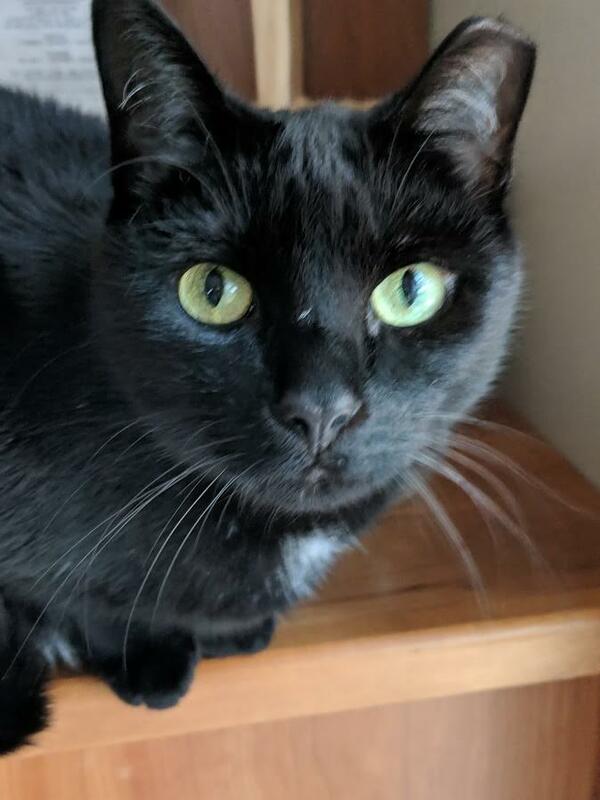 As of March 2019 we also compost the material from our cat litter boxes, a material which is basically shredded walnut shells and stuff the cats contribute. This is done in a self-standing pile of leaves, yard, and garden scraps in our back yard. Keep the moisture in the compost bucket inside to a minimum. Stir the existing compost well. Add in the new material, stirring lightly. Add water. For us, that’s a full compost pail of the water. Stir the compost briskly, mixing in the water and the new material throughout the pile. In addition, in other than really hot days, you still should see worms and, often, steam rising from the pile when you first stir it. So here are the steps I do. I explain why later and in the podcast. That’s inserted below. You saw the two compost bins above. The active one always has this extract heavy plastic sheet on it, weighed down by rocks. This is critter deterrent, and it has worked for years. The bins themselves are heavy plastic which resists clawing and chewing. They are actually two balls which, could, in principle, be rolled. But I discovered that that means they can’t be loaded more than halfway, because they are too heavy. So they still next to one another, in place, and I stir them instead. 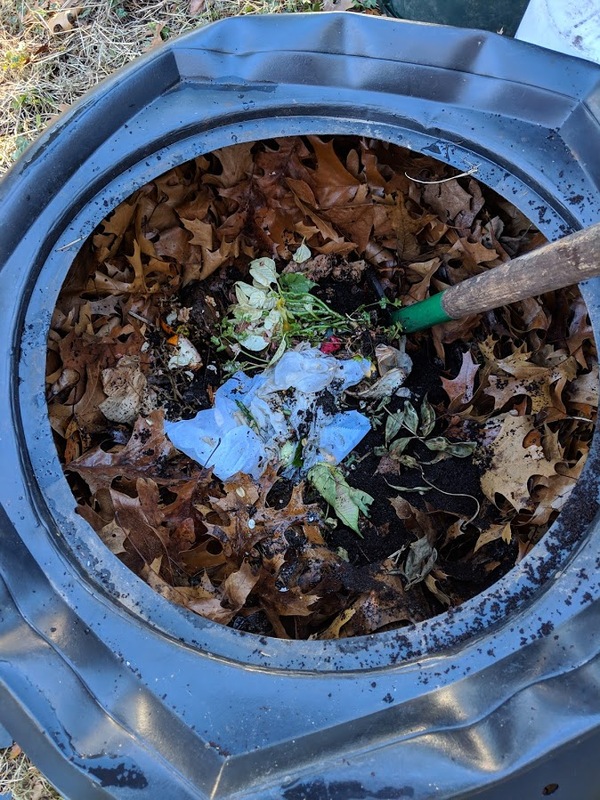 So Winter composting is really quite different than Summer. In fact, we time things to swap when the leaves come down off the trees. 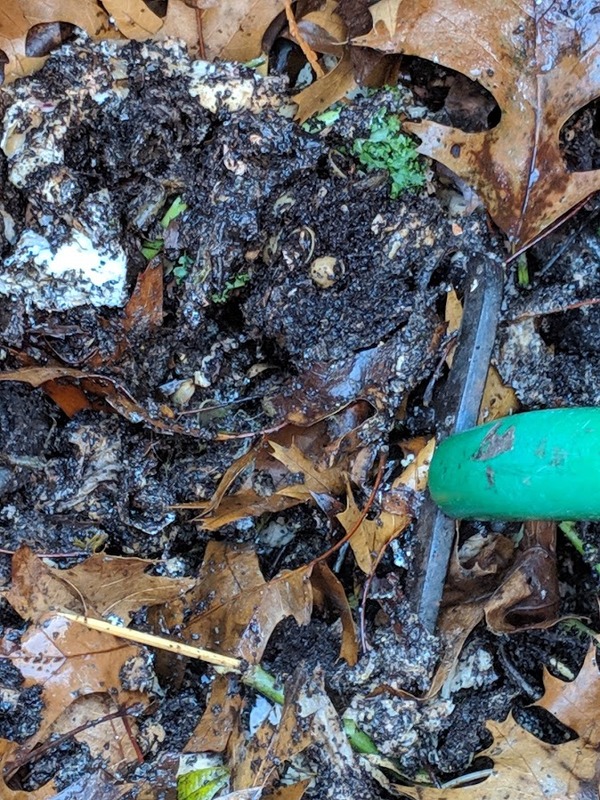 The key point is to keep the compost pile from freezing solid. The only reasonable heat source is the exothermic activity of the microbes cracking and consuming the foodstuffs and organics themselves. 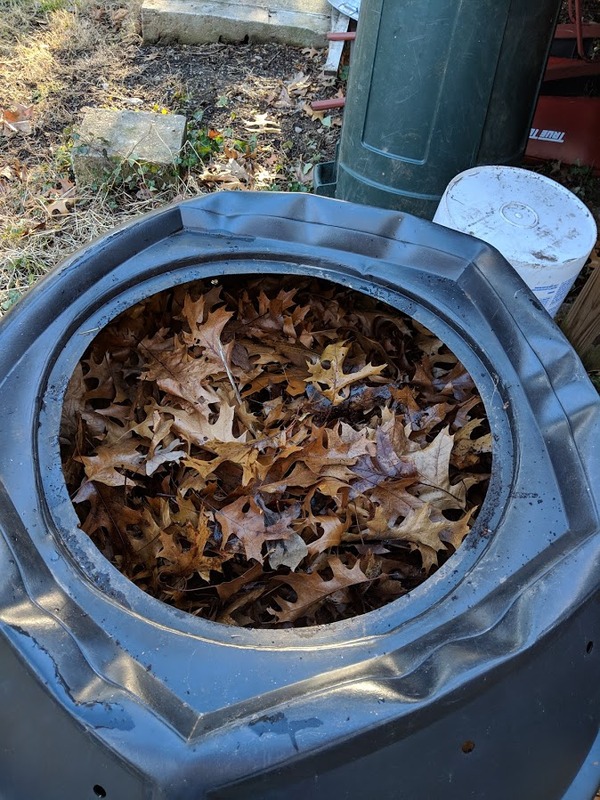 In fact, everything about Winter composting is designed to maximize that. 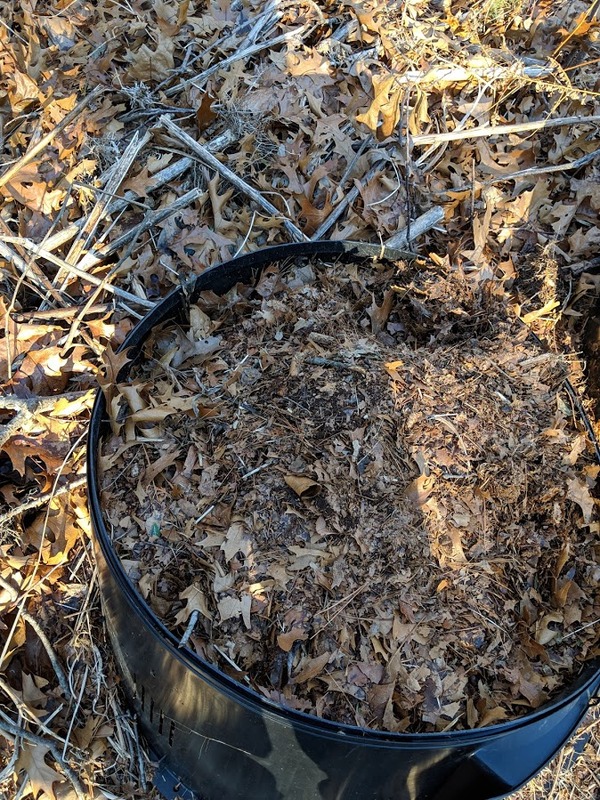 The compost pile begins as a empty contained which is filled with whole leaves. These are compacted a couple of times and topped. Then, an indentation is made in the center of the leaves with the pitchfork, carving out a hole in the middle which will hold the compost. It doesn’t extend to the ground. 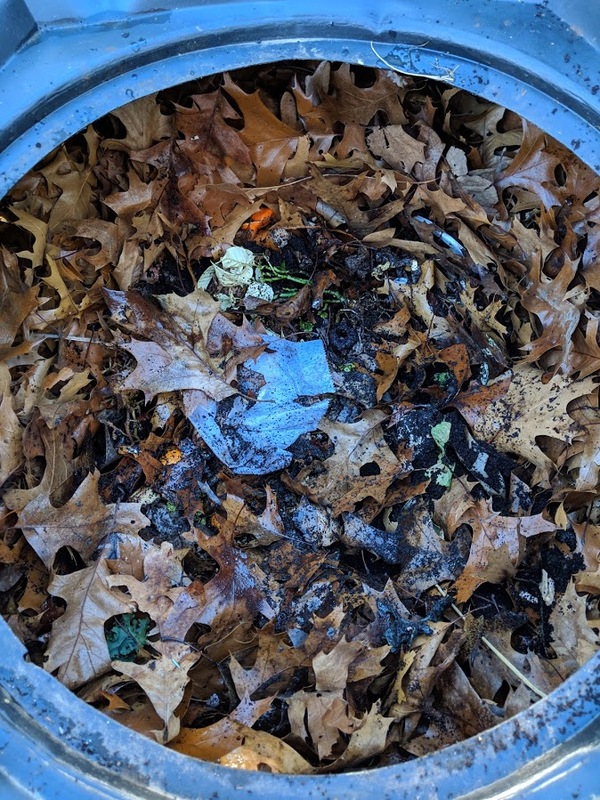 At least initially, the compost should float on top of leaves, supported by them. Initially, new compost is added into the hole. About 50-50 compost from an old, existing pile is added to innoculate the new pile with microbes. Leaves are spread atop, and the bin is closed up. And you’re on your way. Then, it is critical that adding additional new material be done carefully and gently. 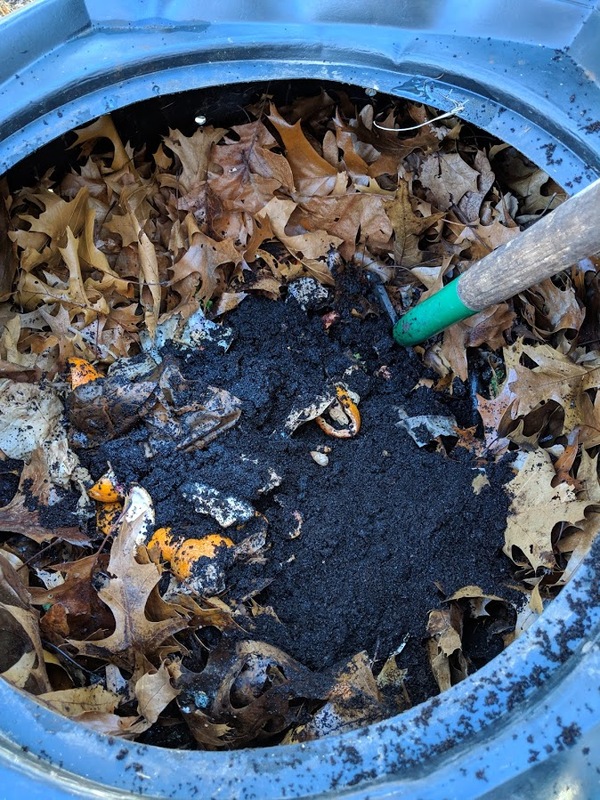 Leaves are gently removed from the top of the compost, and pushed to the side. If it is really cold you, you should endeavor to get the task done quickly. Then, with the pitchfork, plunge into the bolus of compost, and twist it, trying to disturb the compost side to side as little as possible. The idea is you don’t want to break up the clumps of microbes working on that bolus. 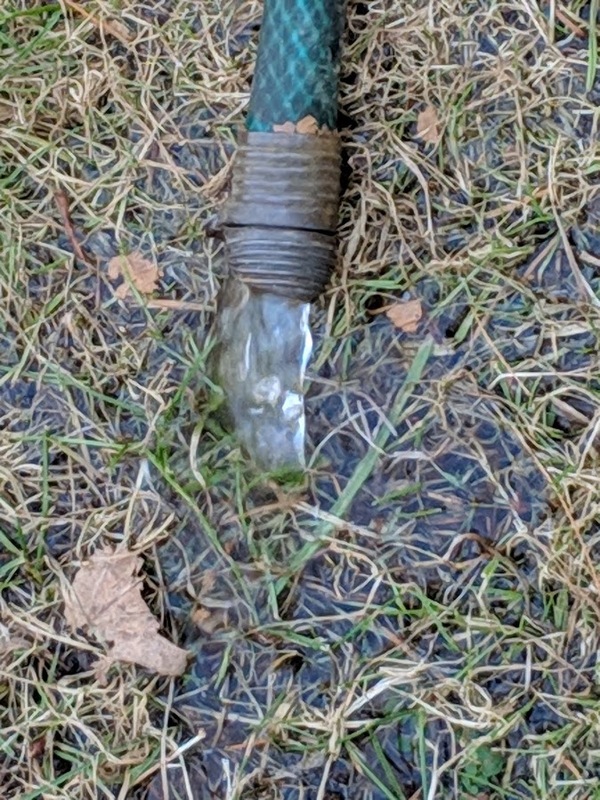 You want to aerate it, sure. Make sure you reach all parts of the pile, but concentrate on the center. Don’t attempt to stir it aggressively as you would in the Summer. That’ll make the effort a failure, because it’ll freeze. In fact, when done correctly, the temperature of the compost in the leaves will exceed 60°C. In all likelihood, this will kill off the worms. 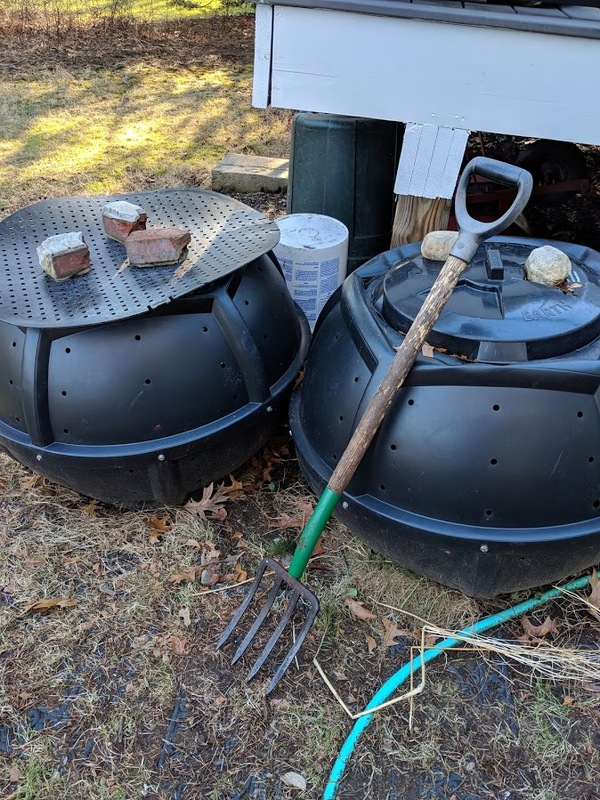 For Winter composting, that’s fine. We’re interested in the microbes. There’s no danger of fire, because that demands temperatures well above boiling. Next, add the compost. Here there’s two sources. One came from coffee hour at First Parish, and consists primarily of relatively dry coffee grounds and paper. Add that in first. Obviously, the plastic bag containing the coffee grounds is left out. 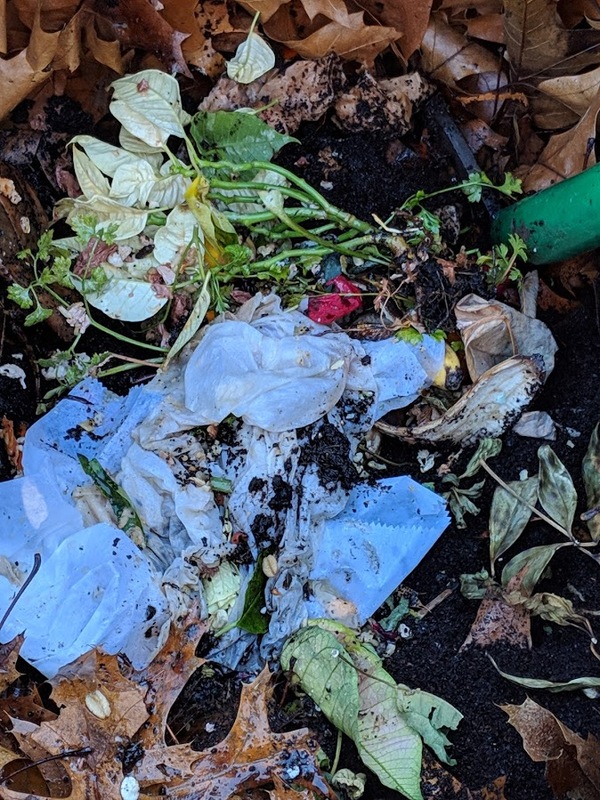 As a matter of fact, don’t even attempt to put supposedly compostable plastic bags in a home composting setup, especially in Winter time. These generally don’t break down except in really high temperature industrial composters. And, even then, I wonder. 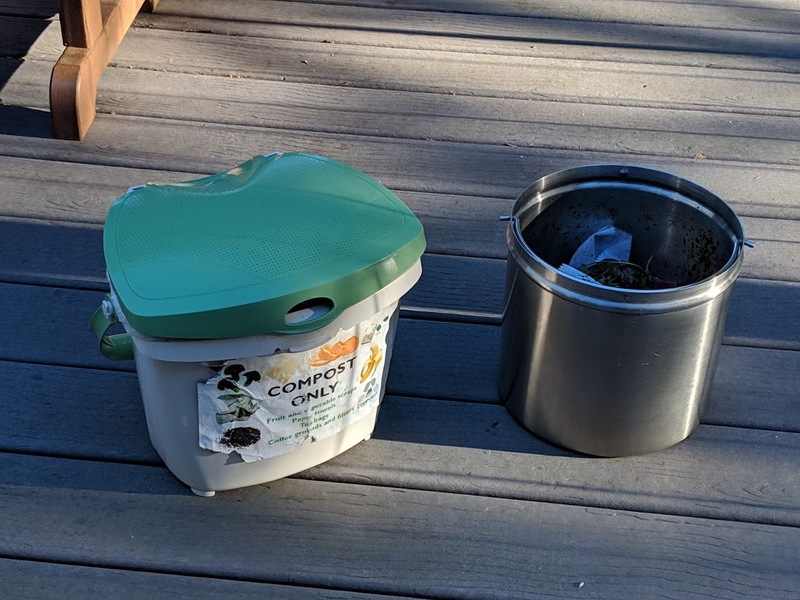 Next I added in our sloppily wet home compost. The idea is to saturate the relatively dry with this. Do not add additional water. When it gets cold, it’ll freeze into a block of uselessness which will stink like crazy during the Spring thaw. A critically important step: Take the pitchfork, but do not stir, not even as gently as above. Instead, simply push the forks down through the new material two to three dozen times. 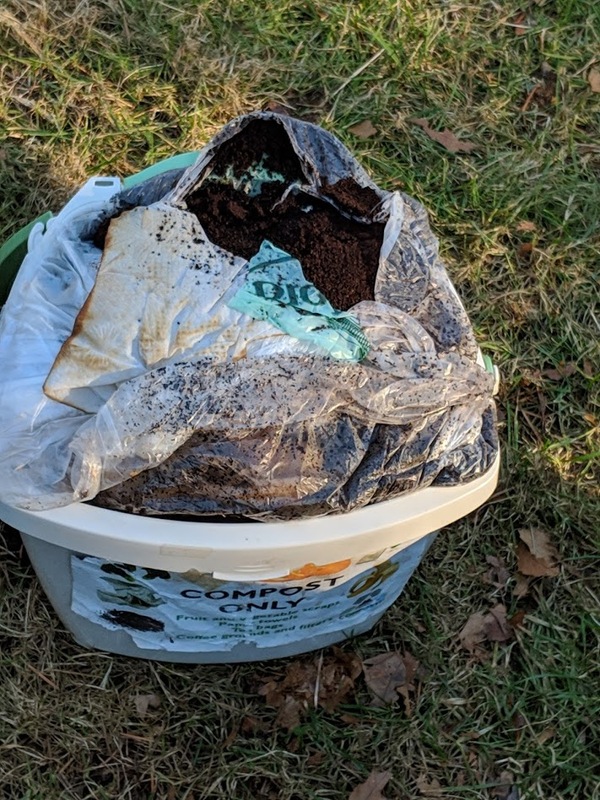 The idea is drag up old composting material and microbes through the new material, so to get it well underway before it freezes. The microbes will give off heat, and keep that from happening. So here’s what it looks like. I’ll sometimes fish a bit of old compost out with the pitchfork and spread atop the new for good measure. 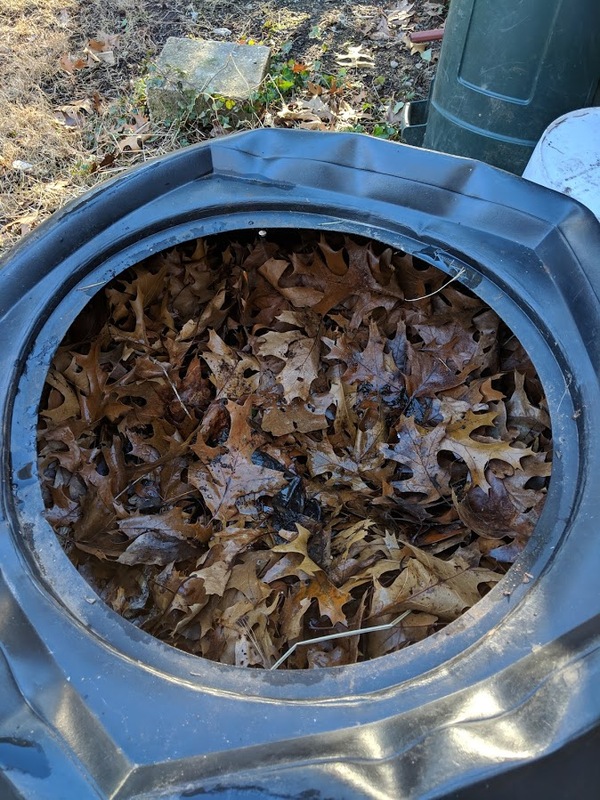 The leaves are scraped back over the compost bolus, and I check to make sure it remains insulated in all directions. The next step is to close it up, and clean up. 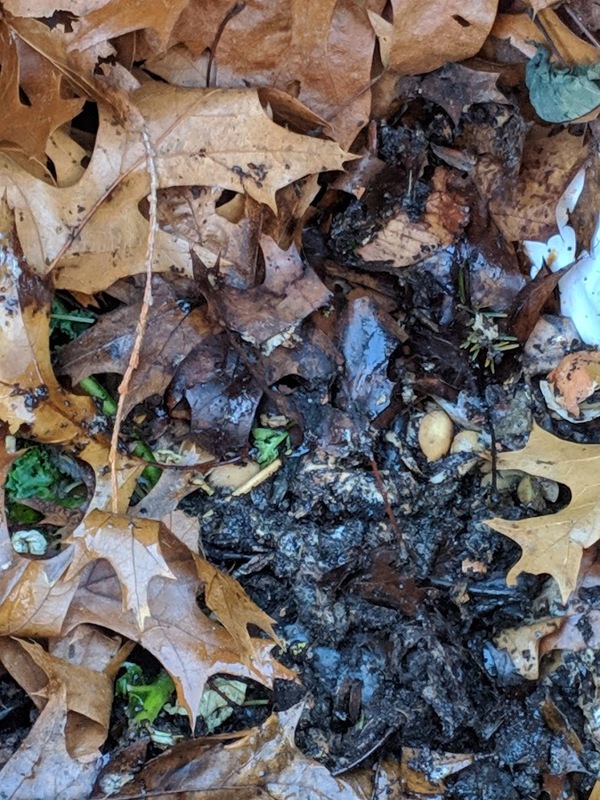 However, today, even though there are no worms in the pile, we have friend visiting, a slug, which, apparently, associated with the oak leaves, has decided that the compost pile is a nice place to hang out during the cold Winter. I didn’t disturb it and placed it back into the leaves. 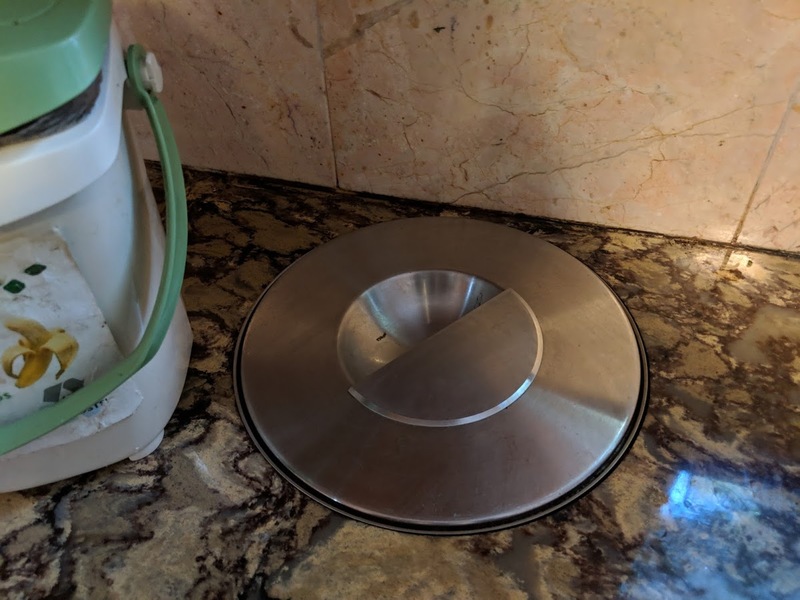 I put the two lids atop, the rocks back, and then clean up. That’s rainwater from our barrel. 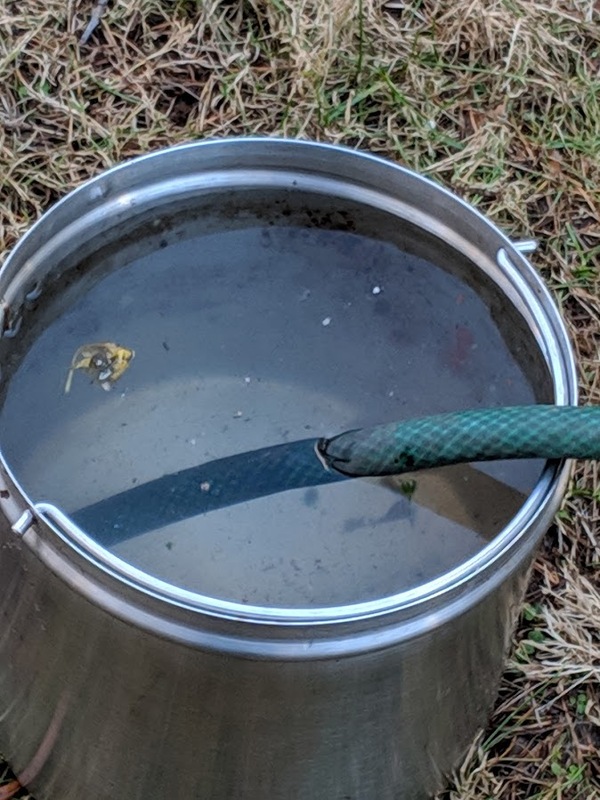 On days when the barrel is frozen up, I need to plan ahead and take out a pail of preferable warm-to-hot water to help with the cleanup. By the way, here’s a tip on the barrel which is intended to prevent something we encountered last winter. We failed to drain the barrel enough ahead of the deep cold, possibly because of excess rains. And when it frozen, it expanded, and rotated by itself on its vertical axis, making it difficult to direct rainwater and such into it. Our solution was to deliberately drain it deeply after the new compost bin setup, even if this meant we were wasting rainwater. 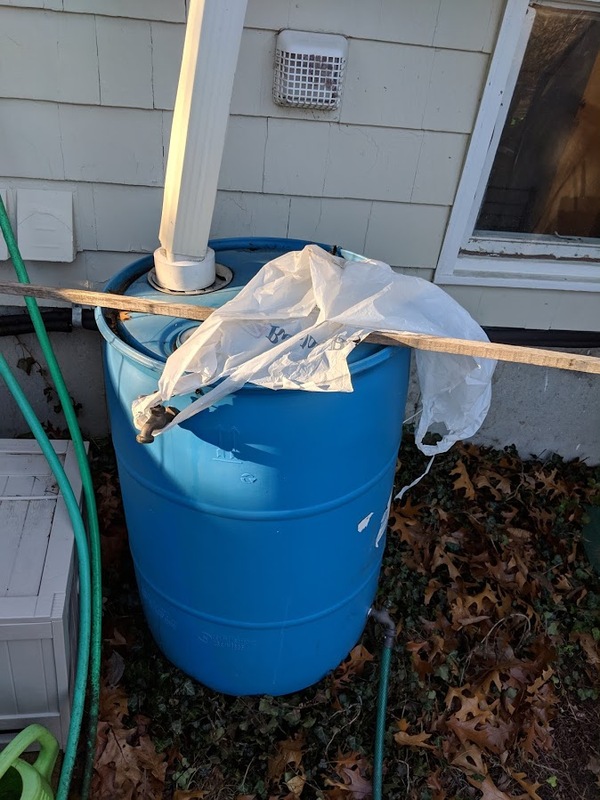 What to do with the washed out compost bin’s water, whatever it’s source? Claire has a row of chipped, composting leaves off to one side of the back yard. I pour the excess water, with its slurry of food, on top of these. 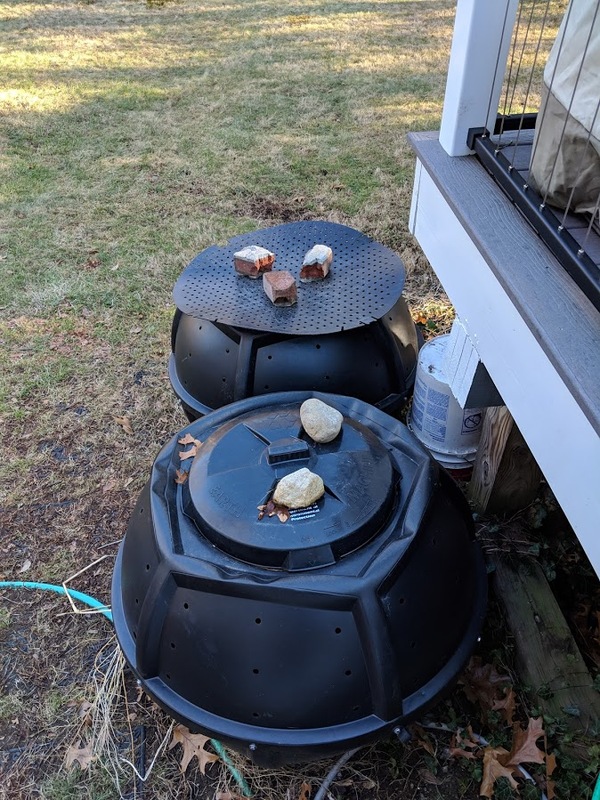 In addition to filtering, this helps the microbes in these side composters, yet isn’t enough to attract any animal who really cares. I’ve seen wintering and migrating Robins, though, poking around these piles. 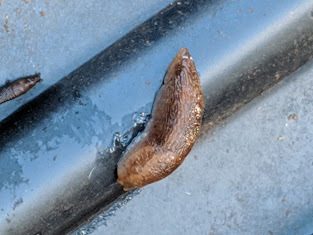 Perhaps they have some worms and other critters, like the slug shown above. E. Ermolaev, C. Sundberg, M. Pell, H. Jönsson, “Greenhouse gas emissions from home composting in practice“, Bioresource Technology, 2014, 151, 174-182. S. Brown, C. Kruger, S. Subler, U.S. Composting Council, “Greenhouse gases and the role of composting: A primer for compost producers“, Environment Quality, 37(4), 1396. A. Brockaway, “Comparing greenhouse gas emissions from organic waste disposal methods“, Summer 2012. A. Sánchez, A. Artola, X. Font, T. Gea, R. Barrena, D. Gabriel, M. Á. Sánchez-Monedero, A. Roig, M. L. Cayuela, C.o Mondini, “Greenhouse Gas from Organic Waste Composting: Emissions and Measurement“, Chapter 2 of CO2 Sequestration, Biofuels and Depollution, E. Lichtfouse, J. Schwarzbauer, D. Robert (eds. ), 2015. K. E. Parent, “Chemistry and Compost“, 2003, American Chemical Society. M.A. Vázquez, M. Soto, “The efficiency of home composting programmes and compost quality“, Waste Management, June 2017, 64, 39-50. I’ll miss him there, but I don’t think Gov Jerry is going anywhere soon. Thanks, Bill, for your year end insights, documenting where we are, and your continued leadership. As someone who grew up with computers (FORTRAN in 6th grade on IBM 1620), and was often dreaming of a technological future, I must say that the only part of that dream which came true were computing, and the Internet. It’s a great part, don’t get me wrong, but I wish we had more in the direction of sustainable economies and living. That said, and at age 66, I remain part of the computing industry, and I continue to be excited by the phenomenon which Marc Andreessen described in 2000, that “Software is eating the world”. Everywhere anyone turns, traditional devices which used to use mechanical connections and actuators are being displaced by general purpose computers, often embedded, and things like electric motors controlled by pulse-modulated signals. These are cheaper, lighter, less power hungry, and offer finer, smarter controls. This extends to analog applications of all kinds, from control boards for music systems and video, to automobile controls. I await the day when they make their long anticipated debut as part of civil engineering projects. On nuclear, I recently studied the field, and believe that the long lamented negative learning curve it exhibits is due solely to the failure of that industry to fail to create modestly sized modular units which can be produced like commodities. Instead, nuclear power has been a cost-plus business and they build bigger and more elaborate all the time, which means these inevitably overshoot schedules and cost targets. We need something like 1 MW reactors which can be lashed together to obtain both arbitrary sizing and greater reliability. (If I lose one server in a farm of ten thousand, like, who cares?) It would be good if they were portable. It would be especially good if they had design safeguards so the materials could not be diverted for nasty purposes, especially dirty bombs. I believe that’s possible, but I also believe that this will require a triumph of imagination, and I can’t see existing players — any more than IBM in its day — coming to that on their own. I wish hope and purpose in this direction for your efforts. No doubt nuclear power was incentivized in the direction they pursued, but the path may have also depended upon contingencies which no one really chose. By the way, “Software is eating the world” is the corporate motto of Andreesen-Horowitz VC company. Among physicists and chemists, well at least the theoretical side of the latter it is well known that electrons have no hair by which is meant that a bunny can’t tell one electron from another. This has serious consequences in quantum mechanics because in a multi-electron system you have to allow for each electron to be anywhere any electron is and it gets quite complicated. True, when an atom is ionized you can trace the electron as it is expelled from the atom, but you can’t say WHICH electron it was. Same for electron capture. You could identify an atom before it is captured, but once it was captured you can not identify it from any of the others in the atomic system. The same thing is true of heat. Heat in an object, perhaps better thermal energy, is random motion of atoms and molecules, translation, vibration, whatever. You can say where heat entering an object came from (say radiation from the sun), but if there is more than one source (trivial case). once it is randomized and in the object you can’t say where it came from. Which brings Eli to the evergreen claim of those who deny the greenhouse effect, that radiation is not important compared to convection. All the best for your continued explanations and wish you happiness, health, and continued good spirits. Your writing is a joy. Happy New Year, everyone. Let’s hope the Angry Beast continues to be kind, and we learn some respect. To understand how far we have yet to go, how long we have known, it is worth taking a look at a publication from 2003, an issue of Wild Earth, one called Facing the Serpent. Although they did not mean The Angry Beast, that’s where we are. As Dr Kate Marvel remarked this year, it will take courage, not hope. Bank of England Governor Mark Carney might not be popular on all his pronouncements, but he’s the most comprehensively educated on the matter of climate risk of any in the international discussion groups of the OECD. Some people will be a climate [change] denier … or take a view that the speed with which domestic policy will change will lag international agreements. People can be on the other side of the spectrum as well. That’s called a market, but the market needs information. He is, of course, completely right about how markets work. This has actually moved onwards. This is definitely worth a look, even if you need to pay for it.